The following hands-on exercises/interactive resources are new and are being tried out for the first time in Berkeley’s CS 169 Software Engineering course (based on ESaaS) in Winter 2019. Feel free to use them—comments are welcome! These will be formally integrated into the MOOCs (see below) over summer 2019.
rails-routing-practice.herokuapp.com — a deployed app that helps students understand how Rails routing works; self explanatory. Basic ActiveRecord practice —gives students practice writing ActiveRecord queries. It comes with a set of Rspec tests, but there is not (yet) an autograder setup for it, so for now we're just giving it out as an optional assignment that students can self-check by running the rspec tests. 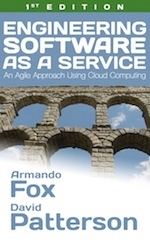 Two free online courses complementing the book material are available on edX: BerkeleyX Agile Development using Ruby on Rails. The courses are offered at least once a year in instructor-led format, and are available as self-paced after the instructor-led offerings complete. You can get a "private" version of those free courses, known as a SPOC (Small Private Online Course), for use in your classroom. The Instructor's Guide contains additional information, including a mapping of the topics in the book to the learning outcomes and topics in the ACM/IEEE Computer Science Curriculum Guidelines for Software Engineering. Mentive offers (paid) small-group tutoring for ESaaS (and other courses). AgileVentures allows ESaaS practitioners and students to work in distributed teams on real software projects for nonprofits. The esaas-instructors discussion forum, moderated by Prof. Sam Joseph. Also available in Brazilian Portuguese and in Spanish. This course exemplar shows how a course using this text fulfills the ACM/IEEE 2013 curriculum guidelines for undergraduate Software Engineering.